Pupils had a lovely time on our school trip today to Tropical World in Lettterkenny. Have a look at the video below for some images from today. Special thanks to Mr.Campbell and Miss Orla for all their help! Congratulations to Cate on winning two medals in the Ulster Championships on Saturday. She won a gold medal in the relay race and a silver medal in the long jump. Cate will now be competing in the All-Ireland Finals in Athlone during March. We wish her the best of luck! Senior Room pupils were learning about similes during the week. We learned that similes are comparisons between things using the words "like" or "as", e.g. "as good as gold". We also listened to Lenka's song called "Everything at Once" as it contains a lot of Similes. Ms. Farry recorded us on Audioboo singing along to it. Have a listen to our first Boo! Students travelled to Castlefinn this morning for P.E. After warming up, we played ball games and running games. Ms. Farry trained us in basketball. We learned how to do chest, bounce and overhead passes. We also did some dribbling and shooting drills. We had super fun! Well done to both of our quiz teams who participated in the Lifford Credit Union Quiz last night. It was held in The Old Bakery in Lifford. Congratulations to our senior team who finished in third place! There were rushes everywhere in school yesterday as students in both rooms made crosses for St. Brigid's Day. Photos can be seen on the Junior Room and Senior Room pages. Junior Room Students have been busy preparing for Catholic Schools Week and have created a lovely display to mark St. Brigid's Day, which is on Friday, February 1st. Senior Room starting to "Scratch"! Senior Room Students in Cloughfin N.S. are embracing Scratch this week and are really enjoying it! "Scratch is a programming language that makes it easy to create your own interactive stories, animations, games, music, and art. As young people create and share Scratch projects, they learn important mathematical and computational ideas, while also learning to think creatively, reason systematically, and work collaboratively." Bit by bit, pupils are being introduced to this wonderful programming language and through collaborative learning and creative thinking are beginning to create their own animations. Ms. Farry has added a new page to the website www.cloughfinns.com/learning-links/scratch/ which contains some tips and our first scripts. We will be adding more to this page over the next few weeks, so watch this space! Caitlin, in 6th class, was the first to have her script added - great for a first attempt!! On December 19, 2012, Canadian Astronaut Chris Hadfield launched aboard a Soyuz spacecraft to the International Space Station (ISS) where he will live and work for five months as part of the crew of Expedition 34/35. We are following him on Twitter. He sends tweets from space and takes amazing photos from the spacecraft. Ms. Farry shows us some on the photos on the Interactive Whiteboard. During the week we saw photos of volcanoes, rice fields in Japan that were covered with snow and the bush fires in Australia. We even saw one photo of Dublin Bay taken from space. We also sent our first tweet to Space on Wednesday. Well we're back and we're busy!! The Senior Room have been writing and printing stories about "Sneachta". It was fun as we used a website called purplemash.com to embed our photos into the snowmen's faces. Ms. Farry put them up on the noticeboard for all to see. The Junior Room designed their own Rainbow Fish and have a lovely display in the corridor. More photos can be seen on the Junior Room Page. On Thursday last we visited Winter Wonderland in the CPI Centre in Castlefinn. A great day was enjoyed by all. Stories read by Mrs. Claus, a disco with the elves, presents from Santa and we saw two reindeer! Chess is a big hit in the Senior Room during wet lunch breaks. We now have four chessboards due to popularity with the students. They have learned all the names and moves of the pieces and have now progressed to looking at tactical moves! Junior Room students have been working on a display using Fabric and Fibre based on the story of "The Snowman". We are all Walking in the Air looking at it!! Fr. Kilpatrick visited our school today for our beginning of year Liturgy Service. We would like to thank him for the lovely service and homily. We sang hymns, played tin whistles and said prayers. It was thoroughly enjoyed by all. Pupils in the Junior Room have also started their Halloween artwork! See the Junior Room Page for their fireworks pictures. Maths Week Ireland has begun! 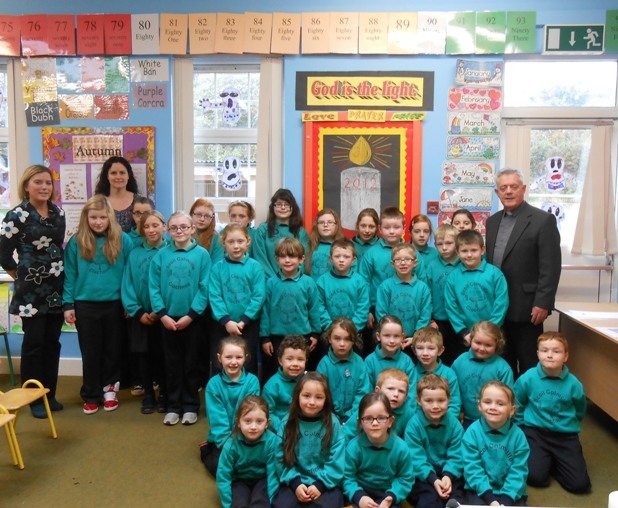 Pupils in Scoil Cholmcille are participating in Maths Week Ireland along with hundreds of other schools around the country. Different Maths activities will be done each day during Maths time. Scoil Cholmcille goes "Batty" for Halloween! Students in the Senior Room commenced their Halloween Art last Friday. Here are some of their creations. Students in the Senior Room travelled to Eclipse Cinema in Lifford today for the official launch of The Riverine Autumn School. Prizes were presented to schools who had participated in the art competition. Our school took third place and won a Nikon Digital Camera for the school. The prize was presented to Shania and Caitlin (6th Class) by none other than Donegal All-Ireland Champion, Neil Gallagher!! Introduction to Scratch - Programming for Students. This page will assist pupils to use Scratch. Link to Senior Room pupils' virtual classroom.